The Science in Dialogue Conference offered different perspectives on how to further develop the dialogue and interaction between science and society. 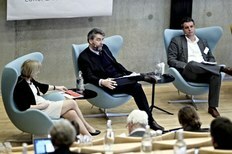 The conference “Science in Dialogue – Towards a European Model for Responsible Research and Innovation” took place from 23 to 25 April 2012 as part of the Danish EU Presidency. The conference was organised by the Ministry in collaboration with the think tank DEA and was co-hosted by the University of Southern Denmark with support from the European Commission. 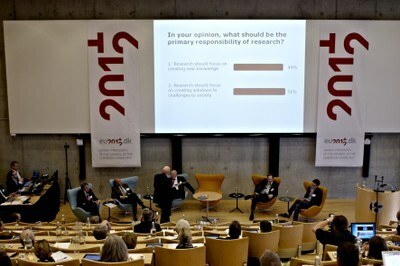 The goal of the conference was to offer a unique platform for elaborated discussions on how to engage society in research and research agendas. T he ambition of the conference was to provide inputs for a future European Model for Responsible Research and Innovation. 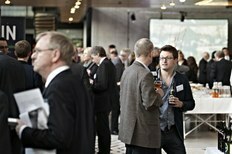 The conference format supported dialogue and interaction between the delegates (policymakers, civil servants, research institutions, business representatives, science communicators and civil society). During all plenary sessions, iPads were distributed to the conference participants, allowing them to easily take part in the panel debates by typing comments and questions that everybody in the auditorium could see and respond to, which ensured a high level of interaction between the conference participants and panellists or speakers. During the conference participants was divided into five workshops. During the workshops suggestions for action within the Science in Society area were produced along with several videos.